Firing up your favourite application, starting some encoding/decoding process and looking at the wall clock and/or rough CPU % usage figures in the Task Manager is not really a scientific way to do video codec benchmarking, for multiple reasons. That is, make sure we are not comparing apples to oranges. A prime example would be to compare a lossless codec to a streaming codec, or comparing 2 lossless codecs but one of them doing RGB -> YUV 4:2:0 compression with internal conversion while the other YUV 4:2:2 direct compression without any conversion. That is, using the same machine, and most importantly, the same environment (no other programs running), and CPU locked both in number of cores and frequencies. We’ll get back to why this is crucial and sometimes hard to ensure in a minute. That is, we actually measure what we are after, in this case codec-only processing time and not hard-disk read/write speed by accident. This is rather easy to verify, we only have to make sure the codecs are set up correctly, they have the same input and perform the same color space conversion internally if needed. This sounds easier than it is. In part, it is easy, we just have to close all running applications, browsers, preferably disabling background services like updates and file indexing, etc. Locking the CPU frequency and cores might not be immediately obvious why is it needed. The problem is caused by power saving and performance boosting technologies like Intel Turbo Boost or AMD Turbo Core. Take the example of running a video encoding benchmark, reading a raw video file from disk. In power saving mode, the CPU will operate at a low MHz frequency. While the app is busy reading a frame from disk, the CPU is idle, remaining in low MHz frequencies, then as encoding of the frame begins, it will scale up. This is not instant however, so encoding the frame happens at a non-constant CPU frequency. Then disk reading comes, so the CPU will enter power saving again. So during the whole process, the CPU will constantly scale up and down, influenced by the disk reading speed. Running the benchmark a second time however, the operating system might have cached the file into RAM, so disk reading is instant (from cache) so the CPU cannot fully enter power saving, and our measurements will be different from the first run, as the CPU runs at different speeds in the two cases. 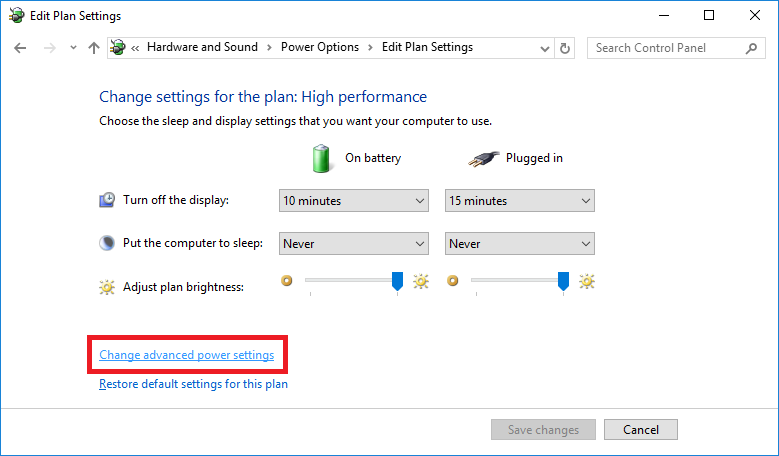 Disabling power saving mode (by selecting “High Performance” mode in power options) is only a half-solution, as the same thing happens with performance boosting. Modern CPUs will dynamically overclock themselves for short periods of time if temperature allows. Using the same example as above, this will result in the CPU doing an overclock-normal-overclock-normal cycle, and if disk reading is slow, frames will mostly be encoded in overclock mode, while the second time (reading from cache) frames will be encoded at normal MHz CPU speed. To get comparable results from our benchmark for each run, the effects of dynamic CPU frequency scaling must be eliminated. 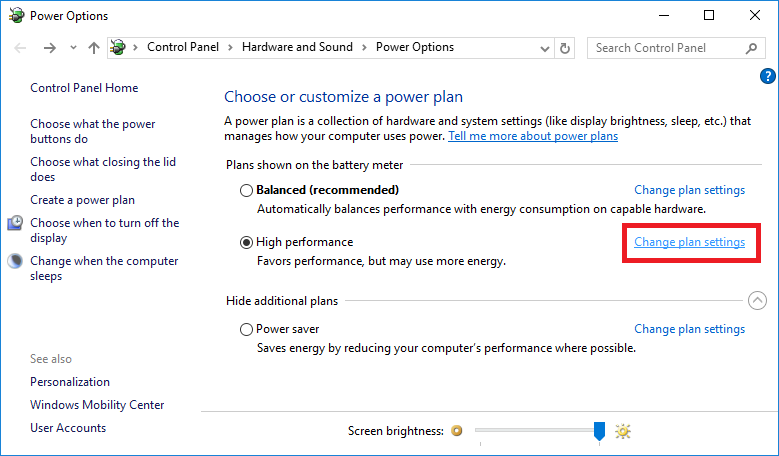 This means disabling power saving and performance boosting modes. As noted earlier, setting the system to “High performance” mode in Power Options is only half of the solution, as it prevents CPU frequency down-scaling but not overclocking. 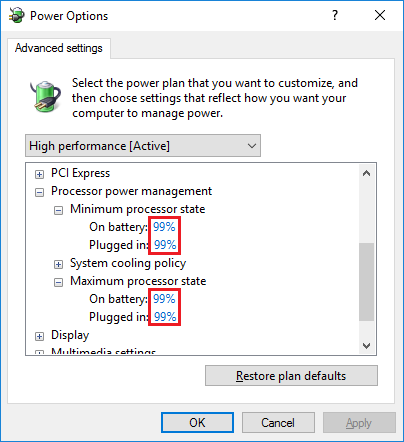 An easy trick to prevent Turbo Boost from kicking in is to set both the “Minimum/Maximum Processor State” in Advanced power settings to 99% instead of 100%. This locks the CPU close to it’s nominal rated frequency. There are other ways to do this, like going into the BIOS settings, however this is the easiest method I’ve found. To verify it is locked, open Task Manager, click More Details and select the Performance tab. 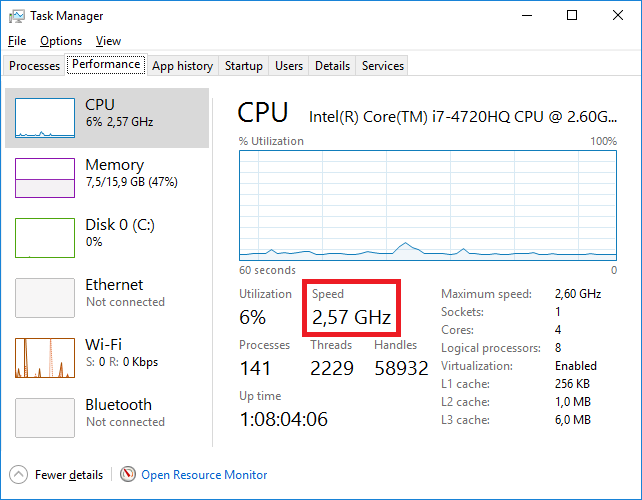 During the whole benchmark process, the CPU Speed shown in Task Manager must not change. If we only want to measure compression performance, we have to make sure that we time only that part of the whole process accurately. This is so simple, yet if you look up various benchmarks in the wild most of them don’t even eliminate disk I/O, the most obvious of them all. Codecbench is a small free command-line program which can do encode/decode cycles from raw video files and time the performance of the codec being used. It can use any installed Video For Windows codec, so you can benchmark any codec installed in the system. I used every 100th frame, but any number will suffice, download at least 20 at random (except the first few hundred frames, those are black). Then rename the downloaded files like so: frame00001.tif, frame00002.tif, frame00003.tif, etc. This will convert the tiffs to 8bit RGB and resize them to UHD resolution and write a raw video file called 4k_bgr24.raw. This will squish the image a bit, but that’s OK, we only do this so that we’ll have the common 3840 x 2160 resolution video instead of widescreen 4096 x 1714. To do a quick encode benchmark, type the following. Note that we need to specify the frame size and pixel format exactly, as the raw video file has no header! The fps above is the timing of the codec encoding only, without disk I/O or any other processing. This will make the codec perform the conversion internally. So there you have it, an accurate and reproducible method to compare video codec performance. As noted earlier, it is very important to lock your CPU cores and frequency! Be sure to verify using the Task Manager.